We offer precision engineered range of inverter based tig machines, which are in compliance with set industrial benchmarks. Fabricated from superior quality raw materials, these machines are used to weld mild steel, stainless steel, copper & titanium. 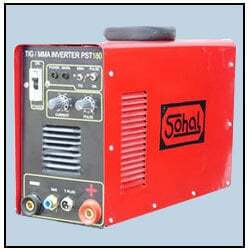 Our Inverter Tig Welding Machines are known amidst clients for accurate dimension and capability to deliver optimum performance for long time. Apart from this, we also offer inverter tig arc welding rectifiers, which are highly energy efficient and suitable for out-door and on site use. These rectifiers offer superior functionality without causing any type of trouble.